I was surprised when I realized yesterday that, of all the spices I cook with, ginger is my favorite. Used grated from the fresh root, or rhizome; powdered in so many favorite recipes, or using the delicious chunks of crystallized ginger in baking, this spice wins, hands down. It is pungent and warming, spicy and calming. Think about how many times you've reached for a ginger ale when you're feeling a little under the weather - or made up that emergency chicken broth with garlic and ginger when you feel a cold or flu coming on? Warm ginger compresses on aching joints or painful sinuses often bring some relief, and a warm ginger footbath warms you, thanks to its property as a rubefacient, which stimulates the flow of blood to a certain area. But, best of all, ginger adds a subtle, spicy zing to your cooking, whether it be tender cakes, cookies, soups, or even marinades for barbeque. This beautiful soup can be served at room temperature or warmed. It's a rich, creamy soup with no cream, no butter, just the warm bloom of fresh ginger ( or substitute powdered if you don't have fresh) and the earthy smoothness of fresh carrots. I often serve this with homemade focaccia and a tangy herb cheese. 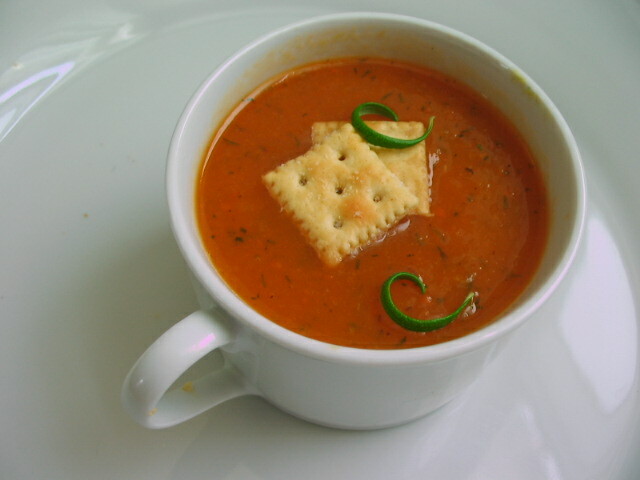 In a saucepan, bring the water , stock, thyme, carrots, ginger, and celery to a simmer. Cook for 20-30 minutes or until the carrots are tender.Remove from heat and puree, using a blender or an immersion blender. Taste, then add salt, the pepper, and the dill to taste. This spicy cookie is always welcome year round, even though they are most popular at Christmas, tucked into baskets, splendid in cellophane bags tied with a pretty ribbon. Children adore them, and adults never, ever get tired of them. A packet of ginger dough in the freezer assures not only a freshly baked batch of cookies, but a wonderful fragrance in your kitchen. Fit two baking sheets with foil or parchment. Set aside. Place butter, brown sugar, spice, and salt in mixing bowl and mix until creamy. Add the egg and mix, then add the molasses and mix again. Add the flour, baking soda, and baking powder and mix until the dough forms a soft ball.Remove dough from bowl and pat into a disk. Cover with plastic wrap and place in fridge, chilling for at least an hour. Remove chilled dough from fridge, set oven to 350F. On a floured counter, roll the dough out to about 1/3 inch. 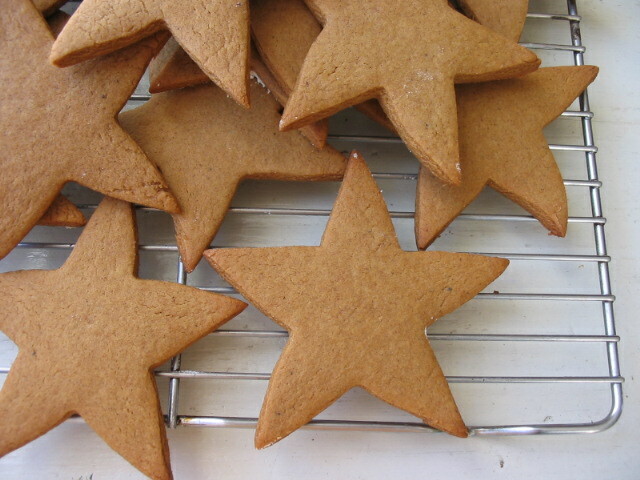 Using medium-large star cutters, cut out cookies, dipping cutters into flour lightly every once in a while to avoid stickiness. Place cookies on baking sheet, about two inches apart. Bake cookies on sheet at a time, to avoid uneven baking. Place first sheet in oven and bake for about 9 minutes ( your time will depend on your oven, dough thickness, and size of cutters). The cookies are ready when they are just slightly firm when pressed with a gentle finger.Remove cookies to a cooling rack for ten minutes, then remove cookies to another cooling rack. If you are planning on decorating or icing the cookies, let cookies cool completely, or your icing will melt. Continue baking until all the dough is gone.Or, place half the dough , double wrapped in plastic, in the freezer for another time.